A post can only be as good as the number of people that see it – so how do you ensure you increase your chances and when is the right time to post a story on Facebook or a tweet on Twitter. Posting often means immediate spikes in News Feed Impressions, however you’ll be seen as a pest and people will unfollow you. Posting too infrequently means you end up missing out on opportunities – so, what is best? A page with 10,000 fans, that only posts half as often as it can may miss around 1 million chances to get content in front of a their Facebook audience. Bigger fan pages should post more often, however it is purely hit and miss, some posts will last for 24 hours, others 10 and other s more, each is unique. However, you can monitor when it leaves your news feed. For fans this depends on a number of factors, though clicks, likes and comments create a better impression. Impressions per post is an account of the amount of times a post has been viewed, though is not updated in real-time and usually a few at a time Facebook, usually calculates every few hours due to demand on its computers. Most posts don’t receive enough clicks to allow you to calculate whether your fans aren’t choosing to comment, or are just not seeing the posts as they are gone quite quickly. How do you know what is the best time to post you ask? Let us introduce you to one of our favourite tools: Crowdbooster. 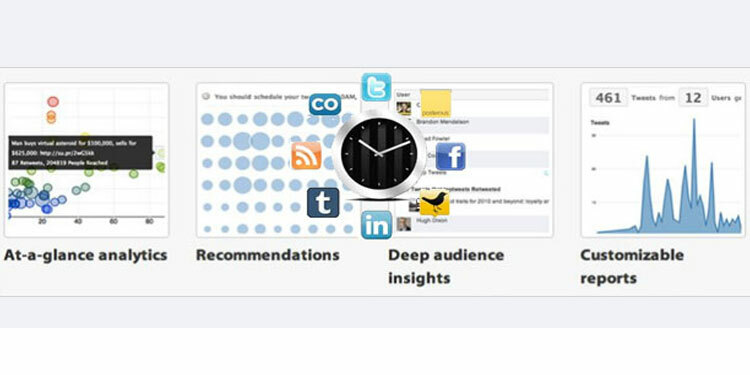 Crowdbooster can tell you who to engage with and what is the best time to schedule your posts for. It will help increase the lifespan & reach of your posts and enhance your overall social strategy. They also offer at a glance analytics and give you an insight into your audience. This can increase post time and your knowhow. ‘Likes’ per post are updated in real time and so give the best indicator of status updates popularity. The best posts get more likes and the data presents and accurate picture of how long a post was in a news feed. However, likes aren’t time stamped so hundreds of likes may be over a long period. So, to measure you’ll have to get out the old spreadsheet, figure out the rate of impression, or when the likes slow. Estimate this on a graph and over 10- 20 posts you’ll get an impression of the post lifetime for your fan page… or make is easier and use Crowdbooster. This is not in any way scientifically accurate and in posts from fan pages of over 2m fans the average post length was 22hrs and 51 minutes. This varies, so real time Likes are the best way to measure the current impact of posts. This allows you to see when you should post your next post. Some posts last less than 10 hours others 48 hours – keep a real time eye on your feed and use tools like Crowdbooster to ensure you know when the best time to post your next status or tweet is. There is no sure fire way to know, so use excel, analytics and some common sense. How do you engage your followers and what is the best time to do so?